I am fascinated by beauty and simplicity. They are combined in beauty contests. Hence, I love contests where those beauties want to be “a cosmetologist or a cosmologist and end global wars and hunger”. Such beauty in simplicity or is it the other way ’round? 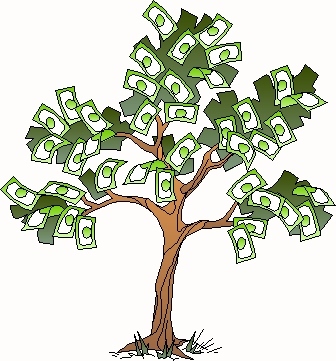 The answer to all our problems - a money tree. As this was to be a simple thought, I didn’t have to think long. Eureka! I declared after 15 seconds: One money-tree per person, would not only give each child a laptop, but save their parents from a lifetime of laborious pain and suffering. I surveyed the world as to where to begin my mission. As luck would have it, BBC World had a report about the International Money-tree Fund and I thought my prayers were answered: other people had indeed thought of a money-tree and started a fund. But when I found their office in Washington, DC , it was a different story. I bid him farewell and flew to Abuja, where the taxi driver asked me why I was in Nigeria. “I’d like to meet the president to discuss some monetary issues,” I said rolling it off my tongue like the Fox guy, right. Prince Oba’s cousin Olotouye came over from Lagos and he seemed a pleasant enough fellow so we got to talking about why I wanted to meet the president. He was quite blunt. “You are wasting your time in Nigeria . We’ve got oil and more than that we’ve got mail – email. Even the president’s got email.” I didn’t get it. But he suggested the USA might be interested in a mission like that as they certainly needed a money tree to fight the wars they’re in. Why didn’t I think of that? I hit myself on the forehead having to retrace my steps to the very place I’d left to come all the way to Nigeria . I have to admit, I was surprised how easy it was to meet George Bush, when I got back to the USA . Turns out it was because I mentioned to the guy at the airport that I had seen Obafemi in Abuja and it somehow translated into I had seen Osama in Faluja, so the Homeland Security guys got me a pass to the top. So I sidetracked from the agenda and mentioned the money-tree mission to GW. “A what war?” I asked as Homeland Security told the guards to get rid of that nut. Some Italian guy named Marco was selling hotdogs on the Mall when I left the White House and maybe it’s stream of consciousness but I thought of Marco Polo and China in that instant. Before you could say “lee” I was on the way to Beijing via Shanghai where fortunes are being made. I should be able to find a backing government there, I thought. But as I left the council, one man came over and asked secretly if I had a copy of the money tree he could clone. I was about to throw in the towel on funding the money tree when, browsing the internet, I came across a Jamaican company’s Web site that offered investors 10 per cent interest a month on “loans” and after a quick calculation I deduced that would be more than 300 per cent interest per year compounded. The company had interests in every conceivable industry. The site said the money was tax-free because the Jamaican government had no regulations on such schemes. “Should be able to interest them in money-tree research,” I mumbled as we touched down in Vancouver . The flight to San Francisco was uneventful and I was eager as I boarded a connection to Kingston . The reggae music was invigorating and I had a positive vibe. An attendant said “Hi Mr. Lee, it’s so nice to have you on our flight. I hope you get support for the money-tree.” I was shocked. It showed on my face. She saw it and explained that a friend of her aunt’s boyfriend’s cousin had been in China while I was there. As the plane touched down on the runway at Norman Manley International I noticed people on both sides waving banners and seemed to be singing. As the plane stopped and we got ready to disembark, the attendant returned and gave me a black, red, gold and green hat shaped like a crown. She also gave me a rod with an ivory lion head. I was puzzled. They had all the other passengers sit and wait until I was led to the open door. As I stepped out a hush turned into a mighty blast. “Welcome to Jam Rock!” It was a sound system on the tarmac blasting Damien Marley and Ini Kamoze. Apparently the company had heard that the man from the Money-tree Fund was coming, with all sorts of opportunities for bearing forexchange. It used its influence in the government and the opposition to have my arrival declared a national holiday to allow the welcome from the thousands of investors in the company who had given up jobs and were living on interest. The scene before me was simply beautiful.